- Ø308mm Heavy metal base for added stability. - Come with Ø38mm stainless steel rod. 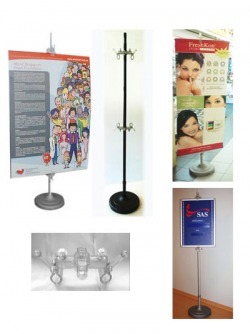 - Powerful clips gives you the flexibity to display PVC banners or rigid posters. 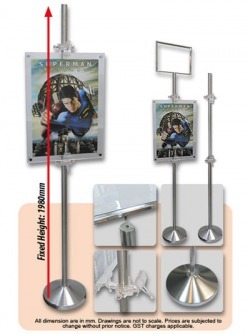 - Ø370mm Heavy solid chrome base for added stability. Can't find a suitable structure? Customized Structure is Your Solution! 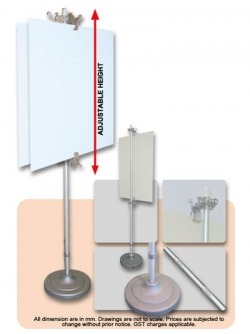 At Bideas, we have in-house mechanical engineers who are able to customize all types of display structure using Metal, Wood, Plastic, Polyfoam, Fibre Glass and other materials. or contact us @ 62594077 for assistance.